My apologies for the crazy lighting in that picture. In the middle of winter, daylighting photos is a crap shoot. And daylighting when the sun is bouncing off of nearly two feet of snow outside the window is even harder. What’s not hard is Roast Chicken with Sweet Potato Wedges. And they do make being trapped inside your house on a snowy weekend taste much better. Of course, you don’t have to wait for a blizzard to commence in order to make this. Scrub the sweet potatoes and cut into wedges (approximately 6 – 8 per potato). Place sweet potatoes and chicken breasts on the sheet pan. Season with salt and pepper, drizzle with olive oil, and mix to coat everything well. Place several sprigs of fresh thyme on the chicken and potatoes. 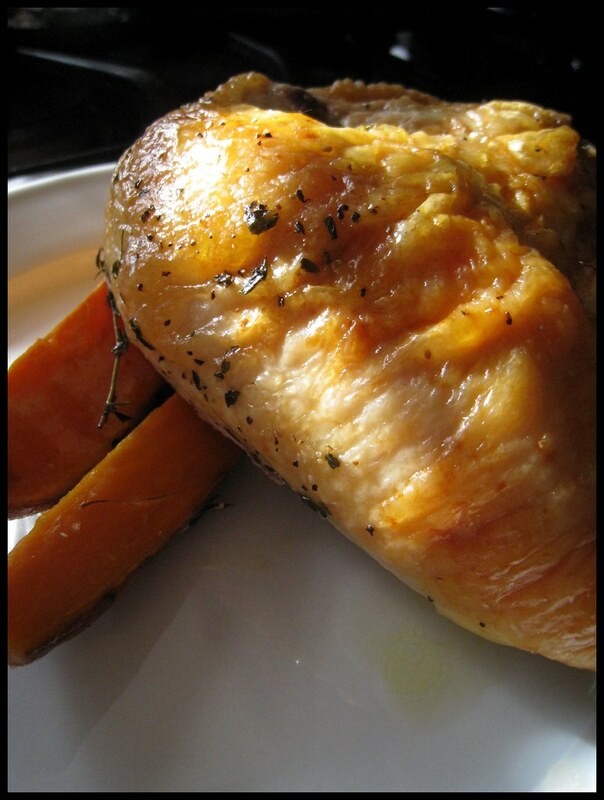 Bake for 1 hour or until the chicken registers 165 degrees on an instant read thermometer. EEEK! Chicken skin! Running to hide in the closet! Wendi, you are just too mean! Witchy-Poo, chicken skin is something where we will just have to agree to disagree! Of course, if we were dining together, I’d gladly take care of any offending skin on your chicken. I love me some sweet potato fries. Or bakes in the case. Either way, I love them. And now I’m hungry.